– In 2014, Brownlee had 1.5 million YouTube subscribers and nearly 130 million total views on 640+ YouTube videos. – As of March 16, 2018, Brownlee has 5.9 million YouTube subscribers and over 860 million total views on 998 total YouTube videos. You’re reading that right: Brownlee has produced nearly 1,000 YouTube videos over the last nine years, including tutorials, reviews, interviews, impressions, and explainers, all built with the singular purpose of helping anyone and everyone navigate the constantly-evolving world of consumer technology. And in a recent phone conversation, Brownlee told Business Insider he feels he’s just getting started. “As far as the video production side, I’m still learning so much of that,” Brownlee said. YouTube/Linus Tech TipsBrownlee films many of his videos in a studio in Kearny, New Jersey. DAVE SMITH: Last time we talked was four years ago, which is long time in technology years and certainly YouTube years. You were working out of your dorm room in Stevens College back then. What’s your setup like now? MARQUES BROWNLEE: We relocated, so basically everything is in a studio environment now, which facilitates video shooting obviously. It makes it a lot easier to have more space. But as far as a lot of the tech goes, it’s actually a lot of the same stuff. The desk is still exactly the same desk I was using in my apartment, the speakers are the same – it’s just all scaled up. The hard drives we need and the cameras we use are different, but it’s just growing from that exact setup from my apartment. 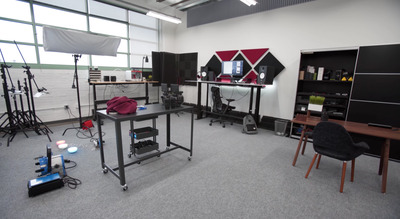 BROWNLEE: The room in the apartment was a couple hundred square feet at most, but the studio space is around 3,000 square feet, which gives us more room for us to mess with things like lighting, depths of field, framing, and building different sets for different purposes and videos. It’s been pretty great so far. 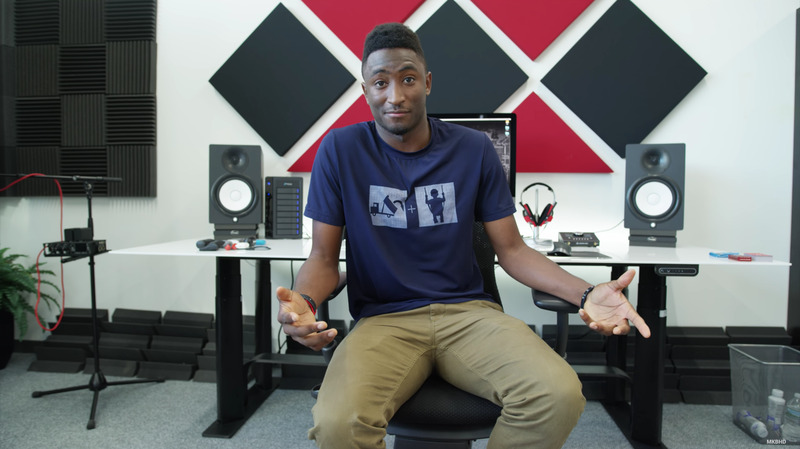 I originally was looking to move out of my apartment into a bigger apartment that would have more space for me to build video stuff, but I ended up just moving and having a separation of where I work and where I live, and we found some studio space in New Jersey. It’s a blank slate for us. 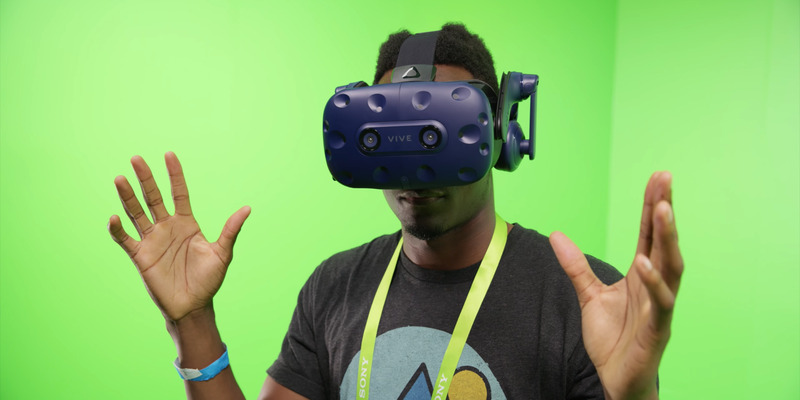 YouTube/MKBHDBrownlee tries the new HTC Vive Pro VR headset as part of his ‘Dope Tech of CES 2018’ video series. BROWNLEE: I think one thing I’m able to notice more that I didn’t really have access to before is the bleeding edge of tech. There’s still the classic reviews of smartphones, tablets, people making a purchase decision – that’s still the core of the content, for sure. But then there’s also the “dope tech,” the crazy bleeding-edge stuff that most people don’t have access to, or don’t even get to see or experience for the most part. Just being a window into that world has been really exciting. There have been companies reaching out and more than willing to offer a look at their tech, or a demo of something that may come to market eventually, or a prototype – fun stuff like that. That’s something I never really got to do before, but now that they’re willing to reach out to the audience that watches these videos, we get to have a little more fun that way as well. 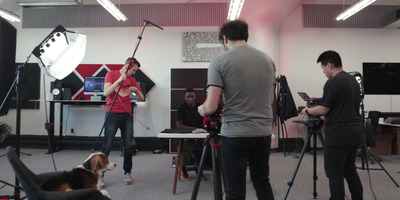 YouTube/MKBHDThe MKBHD video team. From left to right: Andrew Manganelli (with his dog Mac), Marques Brownlee, Brandon Havard, and Vinh Dang. SMITH: When you say “we” and “us” – who is your team these days? BROWNLEE: For the last year – roughly, about 12 months – it’s been the two of us: Me and Andrew [Manganelli], my friend who’s been on full-time helping with production and logistics and management. Having two sets of hands and two brains to work on stuff has been really helpful. 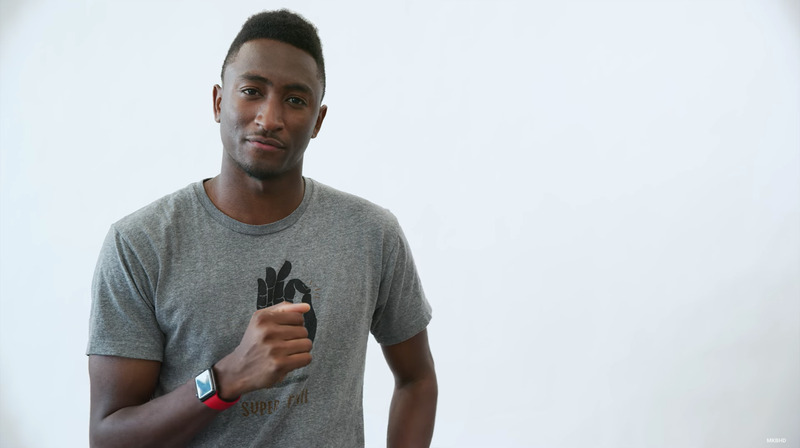 BROWNLEE: We’d been friends before because of Ultimate Frisbee, but he joined the team after CES last year, so January 2017. 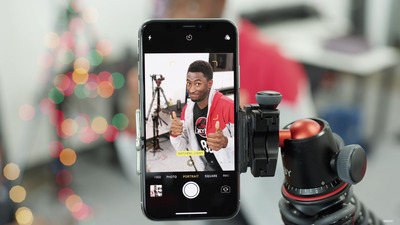 BROWNLEE: The only thing that’s really changed is the actual shooting of the videos, but the process of deciding what tech to review, or listening to the audience, or interactions, has mostly stayed the same, which I think is good. There’s still a direct connection between people commenting on the videos and me reading them, so the extra hands come into play when it’s just more about making better videos or more videos in the same amount of time. 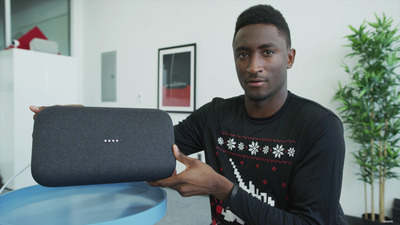 YouTube/MKBHDBrownlee and the Google Home Max smart speaker. SMITH: One thing I’ve noticed about you is that while lots of people try going from platform to platform, you’re still very much central to YouTube. Obviously you, as a person, are available on other platforms like Twitter, but I still consider you very much a “YouTuber.” So, can you talk about YouTube? Have you ever considered hosting videos on your own website or anything, especially as your audience keeps growing? BROWNLEE: So, one of the biggest things about YouTube versus any other platform is the built-in audience and discovery tools. Before this was even a business for me, it was always kind of a fun hobby. People don’t think about SEO and keyword optimization and things like that as a hobby, but it was kind of fun for me to see how I can focus on making a better YouTube channel, and just get better at that personally. Now that it’s a business, obviously it’s expanded and it still grows as a YouTube channel, but yeah, we’ve gotten to the point where we think about other platforms, or other ways to own our own content. I think YouTube has been awesome for the years we’ve been on it, but we’re starting to think about other things now. YouTube/MKBHDBrownlee shows off how ‘Portrait Mode’ works in modern smartphone cameras like the iPhone X.
BROWNLEE: Other formats are interesting, too – they may not be ideal for YouTube, but the podcasting world is interesting, and the live-streaming world is interesting, so other platforms might have unique advantages for those types of formats. With live-streaming, it still comes down to a one-to-one relationship between the people watching the content and me. So we thought about Twitch, for example, which does a lot of really interesting things with live-streaming and discovery and monetisation. That’s worth looking at. Podcasts are another thing that’s maybe not ideal on YouTube, but maybe we host that somewhere where it’s available in a recording afterwards, or maybe it’s interactive as we’re recording. There’s all kinds of questions with that. So YouTube is great for obviously the video on-demand that we specialize in right now, but we’re always curious about trying other things. 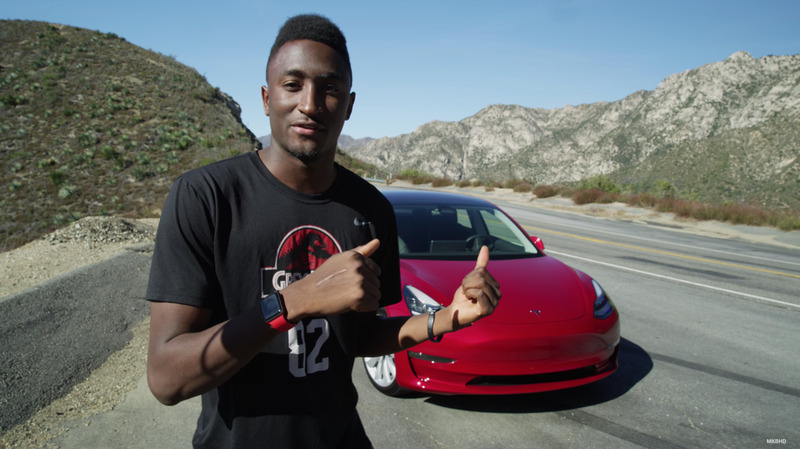 YouTube/MKBHDBrownlee takes the Tesla Model 3 on a road trip in the first episode of his ‘Auto Focus’ series. SMITH: You review tons of products, but if there’s just one piece of tech you think everyone should have – if everyone had unlimited money, of course – what do you think that would be? BROWNLEE: Oh man. I know everyone has a different taste as far as personal technology – like, smartphones are maybe the most personal decision you can make – so I don’t know if I can recommend one thing for everyone. But, I do like the idea of everyone moving, eventually, to an electric car. BROWNLEE: It’s a far-off, future idea. But as electric cars get less expensive and as they get more mainstream, and especially as the infrastructure grows – I think that’s a concern a lot of people have, about where do I charge and how much does it cost to charge overnight, things like that – I would love for everyone to get the experience to have an electric ride. To not pay for gas. The smooth, silent ride. All that stuff. That experience is next level, I think. 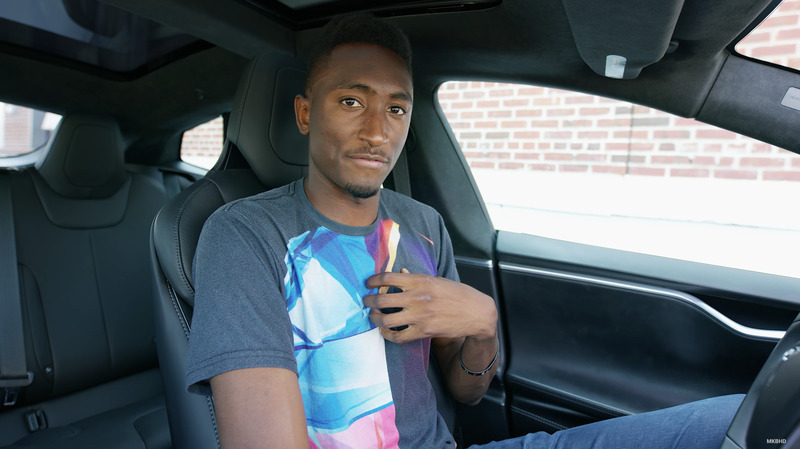 BROWNLEE: I have the most experience with Tesla obviously, so I would naturally recommend Tesla. I’m about to go out and have a second look at the Tesla Model 3 so I’ll have my conclusions about that pretty soon, but I know Tesla Model S is an ideal experience as far as everyday driving goes for me, so that’s where that comes from. 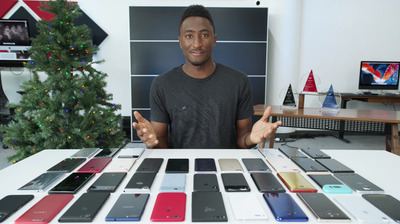 YouTube/MKBHDFor the MKBHD Smartphone Awards, Brownlee and his team created physical awards that were later sent to the companies that made the smartphones. 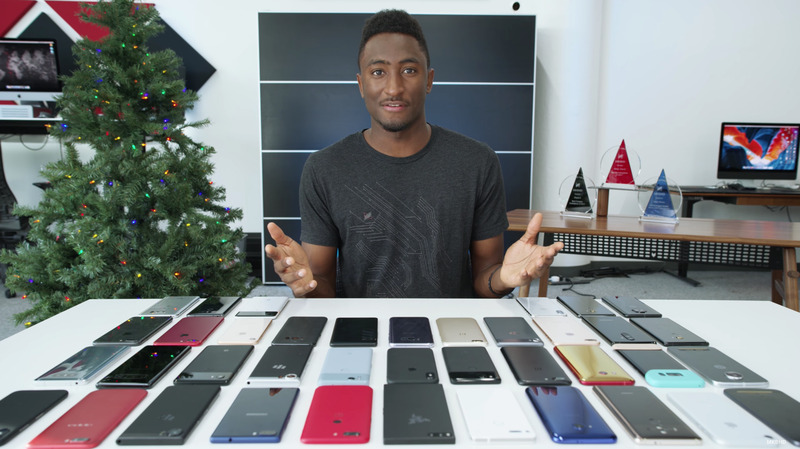 Every single phone on his desk was released in 2017. SMITH: Last time we talked, you mentioned a couple of videos you were proud of: the Wrapsol video where you won a $US1,000 prize, and the LG G Flex scratch test video. But now that it’s four years later, are there any newer videos under your belt that you’re particularly fond of? BROWNLEE: There’s different reasons to be proud of different projects, so I’m more proud of certain videos because of what we were able to accomplish within them. 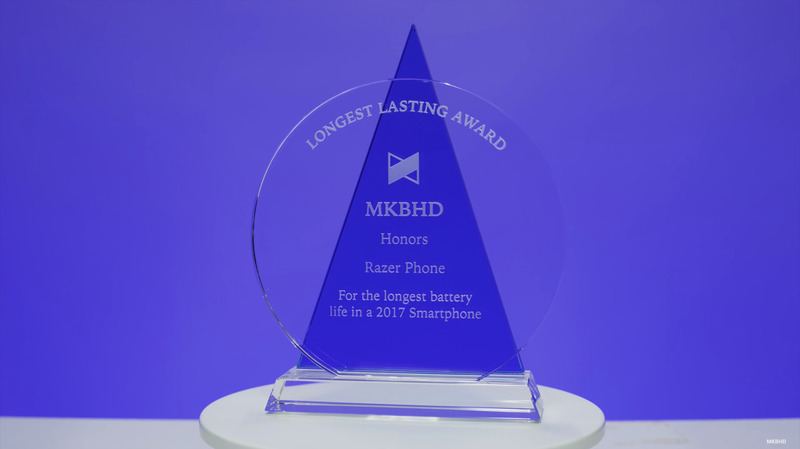 So one video that comes to mind is the Smartphone Awards video, which was something we’d done every year since four years ago. BROWNLEE: We sent Samsung their best award, we sent Essential their award, we sent Razer their award, so a lot of them actually ended up sharing that with their followers, and I thought that was pretty cool – that they actually reached out and were proud of winning that award. That whole Smartphone Awards project was definitely a lot of fun. SMITH: You’re not going to mention Kobe? BROWNLEE: Oh man. See, that was three years ago but you’re right, that’s also between now and then. Having Kobe doing an entire video with me was awesome. I’d love to do that again, that was legit. BROWNLEE: I’m pretty excited for this year, just as far as channel development. And as much as I hate the term “personal brand,” I feel like that’s something that’s going to be making some pretty big steps forward pretty soon. I’m pretty pumped about that. I think we’re all expecting more videos, we’re all expecting better videos, and that’s my No. 1 priority to deliver, but beyond that there’s just a lot of open doors that I have to walk through, and hopefully it all goes well.